Following on from Cork City Council voting in support of a referendum to repeal the 8th Amendment in September of last year, this evening Dublin City Council will be voting on a similar motion proposed by Michael O’Brien of the Anti-Austerity Alliance (AAA). 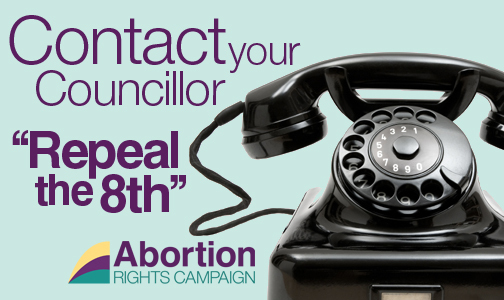 ARC is asking you today to write/email/ring/text your local Councillors today urging them to support this motion to hold a referendum to repeal the 8th. A sample email is below, though we encourage you to personalize your message and include your address so that your Councillor knows they are hearing from a local constituent. I’m writing to urge you to vote in support of the motion proposed to hold a referendum to repeal the 8th Amendment of the Constitution. Though the motion is non-binding, it is an important statement of consensus from our capital city. The 8th Amendment poses a direct risk to the health and lives of women and girls in Ireland and must be repealed as a matter of urgency. One opinion poll after another shows that the Irish people are calling for a referendum to repeal the 8th. We are asking you to represent our voices at the council meeting tonight. You can look up your local Councillors details here. Please bcc [email protected] if you want us to contact you directly about upcoming advocacy trainings and advocacy opportunities! If you want to watch the vote live, you can do so here. The meeting starts at 6.15 pm this evening, and the motion to hold a referendum to repeal the 8th is no. 31 on the agenda. The vote will take place this Monday the 5th of October so people have this weekend to send messages to Councillors to encourage them to support the vote.